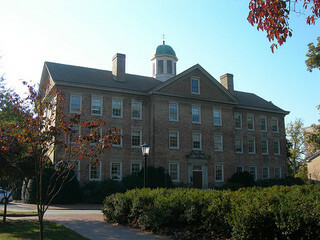 The Ugly Club had been organized by a small body of students at the University of North Carolina in Chapel Hill by 1831 for the avowed purpose of helping homesick students overcome their malady. As altruistic as that motivation may have appeared, it was soon forgotten, and in time the Ugly Club came to be regarded as the beginning of hazing. The acknowledged ugliest man on campus was accorded the leading role in the club, and others nearly as unsightly were granted membership. New students who showed signs of homesickness were called upon to attend a meeting, where they were greeted with, among other things, "horns and tin pans and lusty lungs." Escaping from the presence of these unattractive men and their noise theoretically made the once-homesick students glad to retreat to the quiet of their rooms for a good night's sleep. Richard B. Creecy, a freshman at the university in 1831, wrote that he was homesick when an acquaintance invited him to a meeting on the top floor of South Building. Creecy wrote that the door was opened by the ugliest man he had ever seen, "dressed in the most uncouth style." He wore a dunce cap with horns on it. The president of the club "marched around the room, mumbling some cabalistic words, while we stood alone in the middle of the hall, feeling very much like a fool." Creecy was obliged against his will to dance around the room, to sing a song, and to "wrestle" with the leader. In the latter engagement the freshman was about to throw the president of the club when he was taken by a surprise grasp. The president was winded but succeeded in blackening Creecy's face with grease and making a pun on his name ("greasy"). Those who survived such antics became acclimated to campus life and lost the inclination toward homesickness. Club activity, however, eventually degenerated into such excessive rowdiness that it resulted in damage to property, the use of firearms on campus, attacks on the faculty, and other behavior requiring strong action by the faculty and trustees, including dismissal of some students. Kemp P. Battle, History of the University of North Carolina, 1789-1868, vol. 1 (1907). South Building, University of North Carolina at Chapel Hill campus. Image courtesy of Flickr user jimmywayne. Available from http://www.flickr.com/photos/auvet/5160060028/ (accessed June 12, 2012).